The minimum quantity purchase for standard pricing is 1 product. 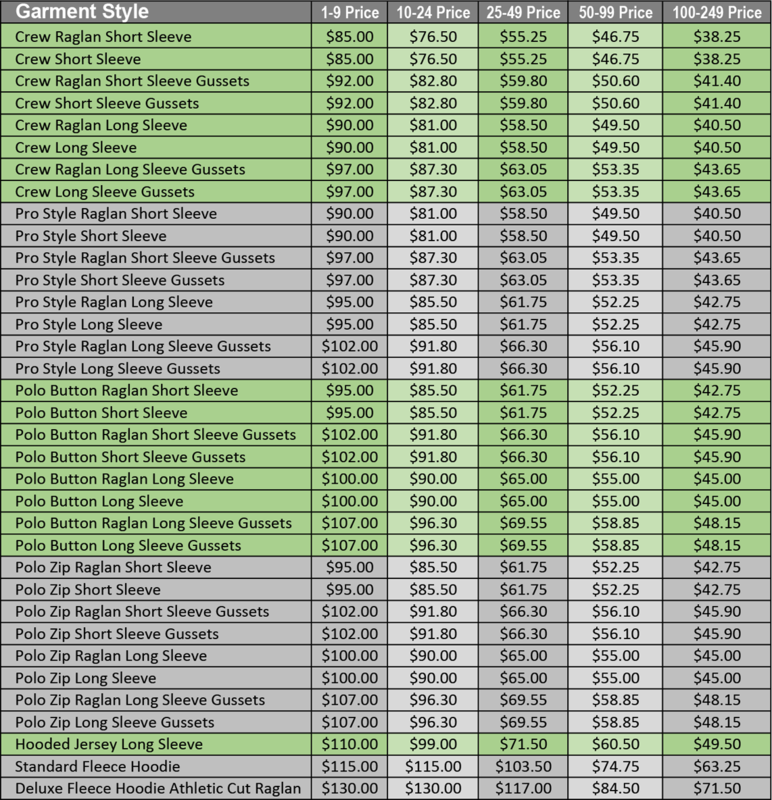 The pricing is the same for Men, Women and Youth sizing. Standard pricing applies to purchases of less than 10 QTY. Volume discount pricing starts at 10 QTY that qualify under the discount pricing guidelines. Product Orders (even if they are more than 10 QTY) that have altering designs, logos, or logo positions will be charged standard pricing. For volume discount pricing guidelines see the "Volume Discount Pricing" section below. Standard pricing shown below represents the cost of 1 product. For tall sizes add +$4.00 per product to price shown below. For 2XL add $2.00, for 3XL add $4.00, for 4XL add $6.00, for 5XL add $8.00 per product to the price shown below. Volume Discount pricing breaks are at 10, 25, 50, 100 and 250 units (call for quote on 250+ orders). The design and/or logos must be the same for all products. Names can change. Orders must have a minimum of 10 QTY of the same product style Jerseys, 10 QTY Hooded Jerseys, or 25 QTY Hoodies. Product styles cannot be combined to reach price breaks. All product styles need to be the same. Men's, Women's and Youth sizing of the same style can be combined to reach volume discount. Long sleeve and Short sleeve are different product styles and do NOT qualify for the discount when combined. RE-ORDERS: Discount pricing is honored for 1 year from the original volume order processing date. Re-orders must have a minimum of 10 jerseys to receive the original discount volume pricing. If the re-order does not have 10 jerseys the cost will fall into the "1-9 Price" category shown below. There are no art or shipping charges for orders of 10 or more products that meet the volume discount pricing guidelines listed above. Volume discount pricing shown below is the same for Men, Women and Youth sizing. For tall sizes add +$4.00 per garment to price shown below. For 2XL add $2.00, for 3XL add $4.00, for 4XL add $6.00, for 5XL add $8.00 per garment to the price shown below. INSTANTLY GENERATE THE APPROXIMATE COST OF YOUR TEAM'S ORDER! Volume discounts will be shown as you exceed 10, 25, 50 or 100 quantities. Men's, women's and youth sizing of the same style can be combined to reach the discount level. Short sleeve and long sleeve are considered different jersey styles. Volume discount guidelines must be followed to receive the volume discount shown in the Atomic Quick Quote Tool. *Pricing is an estimate subject to change without notice.